As I posted several days ago, Blogger has launched new functional gadget that is recent comment, recent post, etc. But there's a little lack, because this new gadget by default only has black color, not suitable for dark template. We're still waiting for customizing tutorial. This widget is developed by Bloggodown. Random posts widget displays random links of your blog post. This help show content that is neither recent nor popular. The widget displays links in form of link lists. So you can change the layout by changing the css of your blogger template. There are two options, random post list and random post with summary. This widget really easy to install. Just go to author site. Related post widget really usefull to extend pageview of your blog. Placed under post and will show another post in same category. You can get this widget from Blogspottutorial. gemana mbak bonk...minta ajarin yang kalo gambarnya didekati pointer mouse bisa berubah gemana carae? @haqie: berubah gimana? effect nya apa jadi ada dua gambar? editing widget more usefull and make the different. aw aw aw..
mbak mau naruk banner kah ke blog ku di haqieart? 10000 2 minggu deh mbak gemana??? the Random Post Widget is so slow, I immediately deleted it after one hour, anyway do u have a tutorial on comment smiley? Bagus dan manfaat, aduh maaf banget sebelumnya saya panggil mass kepada ni yg pnya blog.. he..he.. kali lagi maaf..
it's sooo helpful! Makasih ya!! you ROCKS! mantap bro postnya, bisa tukeran link gak? anyway, selamat lah bong.. u have found your own way ^^ salut2.. ama dirimu. mantap - mantap widgetnya emang sangat berguna..
Eghmm, mbak yang recent comment kok gak jalan yak ?!? boleh minta kirim codenya via email mba ?! 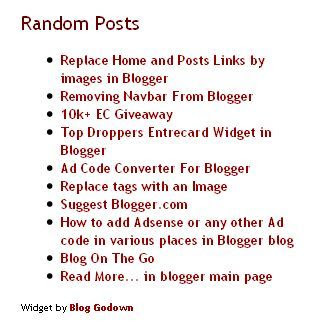 I really love this post ..
Good and necessary widget to make a attractive blog.Thanks. kalo udah pasang related post with thumbnail boleh pasang random post g?? Nice widget, I love it. Thanks very much. Saya bookmark yach blog Anda!! I think I'll use some widgets for my blog. Thanks for sharing my friend. Your tutorial is very usefull. thank you i like it.. The widget - 4. Related Post Widget - the code of this widget is not working.